HOLLY SPRINGS, Miss. 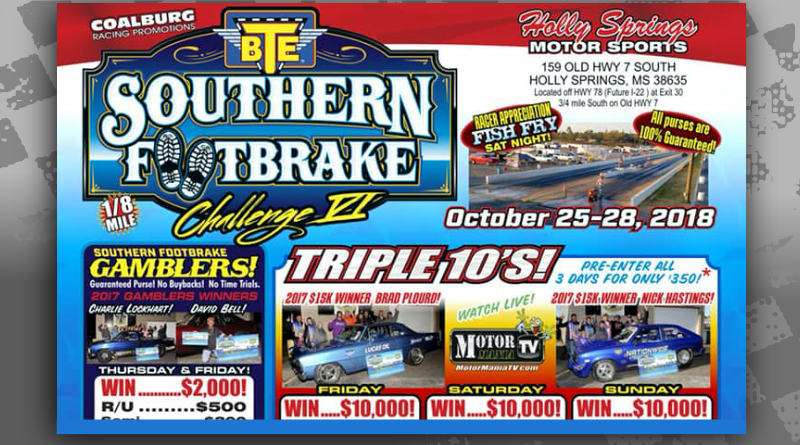 – The team from Coalburg Racing Promotions is back in action this weekend with the 6th edition of the BTE Southern Footbrake Challenge at Holly Springs Motorsports. The event kicks off on Thursday with a $2,000 to win Gamblers race followed by three $10,000 to win events on Friday, Saturday, and Sunday with another $2,000 Gamblers race thrown in on Friday. That’s some serious cash up for grabs for the footbrake crowd. All payouts are guaranteed by the promoters! The race will also include Halloween for the kids along with additional prizes for the contestants. Check out the flyer below and click on the videos below for the live feed for each day of the event. DragChamp is your source for drag race results. Visit DragChamp daily for the latest big money bracket racing news and results.